This morning Chris and I had a photo shoot with our wedding photographer to take some engagement shots. I'm not going to give it all away now, but I'll just say that we're thrilled with the results. I'm happy to announce that Stella's sweater got finished just in time! We left our apartment this morning at 9:30am to go to the shoot, at 9:29am I was weaving in ends! She looked perfect! A cabled pullover with twisted stitch ribbing turtleneck, knit in TFA Green Label Aran Weight yarn in Sand. Chris has put in a request for a matching one! It was such a fun way to spend the morning! Thanks to everyone who left nice comments on my last post about the new Dipped Infinity Scarf Kits, I will be restocking my Etsy shelves regularly, so if I happen to be sold out when you stop by, try again soon as I'll definitely have more! I finished my Dipped Infinity Scarf this week. It's such a fun and quick knit. It's the type of knitting that you just hate to put down, you always want to knit just one more repeat so you can switch colours and see how the next pairing will work. 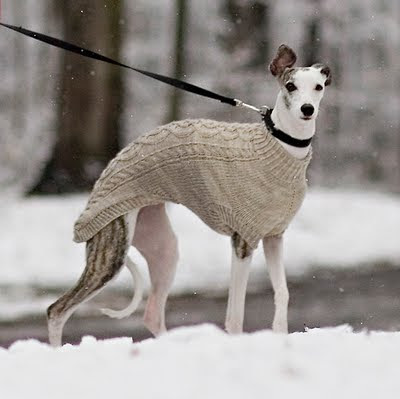 And when you're done, it's the type of knit that you just can't stop wearing! It's really lovely and soft and snugly. This will definitely keep me warm all winter long. I love it! Because I love this scarf so much, I decided to share the joy with you all and make up Dipped Infinity Scarf Kits. 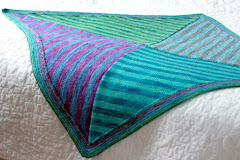 This is the colourway that I knit the sample scarf in. I'm calling it "Red". Of course there's a "Blue" colourway, I will almost definitely be making another scarf in this! And a natural and earthy "Green" colourway. I really like the pop of yellow at the end. The kit includes enough yarn to knit the pattern as written with the colours in the order shown. There isn't the same amount of each colour, so it's important to knit them in order to make sure you don't run out! Back in April I bought a bunch of lovely designer fabrics and patterns, with the goal of doing more sewing. By May I had made my first Multitasker Tote. I loved it then and over 6 months of constant use means that I love it even more now! It's the perfect tote. I bring it with me shopping and can avoid coming home with plastic bags. I stuff it full of yarn and WIP's when I go visit my parents and want to show my mom what I'm working on. It carries a lot, is very comfortable and also, is very cute! I get a lot of compliments on it, so the other day when I was itching for a little sewing project to do, I decided to make myself another tote. I used a combination of Anna Maria Horner fabrics for the body and the strap, and a lovely brown and turquoise polka-dot that I picked up at Fabricville for the pockets and lining. I really like the way they work together. I made the straps a tiny bit shorter this time so the bag sits a little higher on my hip. It took us a couple tries to get a decent shot outdoors. We were trying to stage it as though Stella and I were just casually standing in front of a tree. People say she's photogenic, but it often takes a lot of coaxing to get the shot! 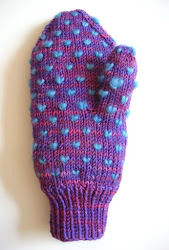 This is my third pair of Fiddlehead Mittens, and surely not my last! My sister has requested a pair for Christmas, so I'll be casting on for those soon. I'm not sure what colourway hers will be in. I've been dreaming up lots of new options, she's partial to my original Jewel colourway, but I'm not super keen on knitting the exact same colourway twice, so I'm going to try and come up with something different. I'd like the next pair that I knit to have the contrasting colours in the background rather than the foreground, so instead of the motif colour changing, the swirly pattern will all be in the same colour, and the background will shift. It's just fun to mix things up a bit. This pair have yet to be lined. It's really tough to muster up the discipline to line them! At this point they look finished, are totally wearable, and are very warm. I've been wearing them for the past couple of days even though it hasn't really been justifiably cold yet. The lining definitely adds a really nice finished look, adds an extra layer of warmth and hides all the floats on the inside of the mitt that fingers could potentially get caught up it... I have plans to line them at some point, but I've got lots of other things to do between now and Christmas so I've sort of bumped the lining down my list of priorities. Until then I'm perfectly happy wearing them as they are! I've spent a good part of this fall putting together Fiddlehead Mitten Kits. I am forever staring at tiny little skeins of yarn lined up in pleasing colour combinations. 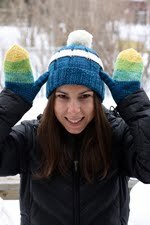 Yesterday I decided that it was high time I had my own pair to sport this winter! I picked my favorite colourway and cast on. I've got one completed outer mitt and I hope to have it's mate done tonight. I've photographed it inside out because in the final FO shots it will surely be right side out, and the inside is just too lovely to be ignored. I love this colourway. I know that a lot of people have been skeptical of the bright yellow, but I think it really makes it sing. Knitting with colour always excites me. Though I love this colour combination, I can't help but want to cast on for several other potential combo's all at the same time. That's the great thing about knitting with colour, the possibilities are endless! There is lots going on behind the scenes here at Tanis Fiber Arts. In the coming months I will hopefully introduce many new things. 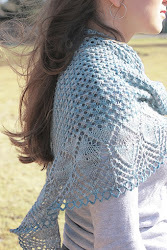 New colours, new kits, new patterns, a new website and a new yarn! I don't have too much to give away about all that I'm cooking up just yet, but here's a sneak peak of my next new yarn, hopefully to arrive before Christmas. Luscious, luxurious 100% Mulberry silk. Mmmm. My cousin Michelle and her 2 kids, Abby and Elliot, came to visit us in Montreal this past weekend. We had lots of fun colouring, reading, baking and following Elliot (11 months) around the house. He is fast! As always, Michelle dressed the kids up in style! There were hand knits galore! Saturday morning we got up and Elliot was sporting this adorable little mountain sweater. I made this sweater for Abby when she was a baby and it's always been one of my favorites. It looks just as good on Elliot! We took the dogs for a walk in the woods and Abby was keeping her ears warm with a fair isle hat that I made for her last year. She asked her mom how to make a pom-pom last week, I think that's a good sign that she'll be a great knitter one day! Abby's birthday is in December, but I wanted to see her open her gift this year, so she got to unwrap her Little Miss Greenjeans cardigan a couple weeks early. It fits her perfectly! She's got just enough room to grow into it, so it will last all winter and maybe even into next Fall. Perfect! Lastly, when they were getting ready to head out today Abby got dressed in this sweater that I made for her last year. Still fits! And those fish buttons are still awesome. You gotta love kids in hand knits! It was great to spend a weekend with my cousin and her kids, and I love that they get good use out of the things that I've made for them. Before she left Michelle and I went over a very brief knit and purl tutorial. She's knitting her first scarf and is well on her way to becoming a pro. By the time I have kids of my own, maybe she'll be knitting the hand knits that they live in! Step 3: ply and admire! Introducing the Alpha Sock pattern. I designed this sock pattern for my dad. He loves hand knit socks, and really only has two requirements; his socks must be knit out of a "respectable" coloured yarn, and they must be stretchy and comfortable around the leg. Keeping that in mind, the Alpha sock was born! My dad's middle name is Alpha, and seeing as how this is my first sock pattern, the name seems very fitting. The sock features a moss stitch panel that is flanked by two cables running down either side with a twisted stitch detail flowing out of the cuff ribbing. The pattern is repeated twice over the sock. It was designed to fit a man's foot, to knit a smaller size for a woman, I would simply recommend going down a needle size or two. Back in June I started spinning with a really lovely superwash merino roving that I had dyed in my favorite shades of blue, purple and pink. At the time, I was very proud of my spinning job! I knew it wasn't perfect, but it was my best yet! I have been a bit nervous to knit with my handspun. I put so much effort into the dyeing and the spinning, that by the time I get to actually knitting with it I'm worried that I'll chose the wrong pattern, or I'll make a mistake and all my hard work will be ruined! I knew that it was time that I face my fear! I wanted to knit a little scarf for my Goddaughter Abby for Christmas, and I knew that this skein full of purples and pinks would be perfect for her! I cast on 20 stitches on 6mm needles and knit until I didn't have any yarn left. It only took a couple hours of knitting! And it is perfect! I think that this may officially be the hardest knit I've ever had to part with! 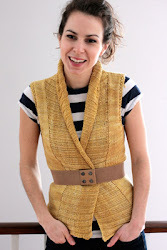 I love all my knits, but this one is special. I love how even though I'm a new spinner and I didn't have any plans for controlling the colour shifts in the yarn, that garter stitch is so forgiving and that the colours blend in and out of each other like a deliberate watercolour. This scarf is so soft and smooshy and cozy, perfect for a little girl. Maybe that's what I love about it so much, it really appeals to the little girl in me! I am sad to give it away, but Abby's worth it. Rest assured, I will definitely be making myself one of these someday soon. For the past couple of years I've always given my dad a pair of hand knit socks for Christmas. This is a new tradition that I hope is going to last forever! He just loves his knitted socks, and I love knitting for someone who I know appreciates all my hard work. It's a win-win situation! This year dad is getting a custom pair of socks that I'm designing just for him in my Midnight colourway! I've got the first sock done, and I love it! I hope to finish the second one this week and then write up the pattern. And just because I'm so lucky to have such a snugly dog and such cozy blankets to snuggle under, I thought I'd share this latest picture of me and Stella. The other day I decided to buy a couple pairs of new knitting needles. Nothing particularly exciting, just some sizes that I was missing. I went on to Knitpicks and decided that while I was buying needles I might as well take a peak at their new stuff, no harm in looking right? Well, it didn't take long before I had not only bought my needles, but I had also bought a ridiculously elaborate kit to knit myself a Russian inspired old lady purse. Naturally, I chose the blues colourway. I'm not convinced that it's the nicest colourway, but I'm pretty sure that I'll never actually carry this purse around with me because A) it's not really my style, and B) if I ever finish it I will undoubtedly have put way too much blood, sweat and tears into the thing to ever risk bringing it out in public and getting it dirty. I figure I'll knit it and then just hang it on a doorknob in my apartment where I can admire it. Don't get me wrong, I think it's gorgeous, just a bit excessive. Anyways, so that's why I chose the blues, because if I'm going to spend hours knitting something that I'll probably never use, I might as well be using colours that I love, regardless of the final outcome. And I do love these colours! For me, this will be an exercise in process. The pattern is really quite complicated. It incorporates colourwork, short rows, steeking, intarsia, duplicate stitch... some techniques I've never done before. It will be a learning experience, and without the pressure of having to be able to wear it, or make it fit properly, I think it's the perfect vehicle! So, that's all great, I'm not sure when I'll get to it, with Christmas coming up and TFA taking up most of my time, this will probably languish in the stash for a while. A while ago I read a post by Glenna which highlighted how much palette yarn she had in her stash. I commented on how I thought that she did in fact have a lot of palette, and how I had a bit as well, but not nearly as much as her. This morning as I was putting my bag kit in the stash next to the other "little bit" of palette yarn that I had I realized that I'd been kidding myself. I have 59 balls of palette yarn! Many of them are duplicates, a few of the blues are even triplets! It's silly! Especially since I've only ever knit one thing in palette! But my, they are lovely, aren't they! ?